The Skua is an aggressive, piratical seabird, which feeds itself and its young by stealing food from other birds. There are two main branches of the skua family, the Great Skua, and all the rest, which, in the Northern Hemisphere, includes the Arctic Skua, the Long-tailed Skua and the Pomarine Skua. The Great Skua is known familiarly in Scotland as the Bonxie, a name which is thought to come from the old Norse word for an old, scruffy woman, which is Bunski, which describes this bird well. The Bonxie, is a large, brown, broad-winged bird, an aggressive thing, which will attack other birds, such as gannets, and puffins, and steal their food, which has earned them the nickname Pirate of the Seas. They will also eat smaller birds, such a puffins, and their eggs, or generally just scavenge for food among seabird colonies onshore, or on the surface of the sea. Great Skuas seem to have no fear of man, and the unwary who venture near a Bonxie's nest in the breeding season will be dive-bombed mercilessly. 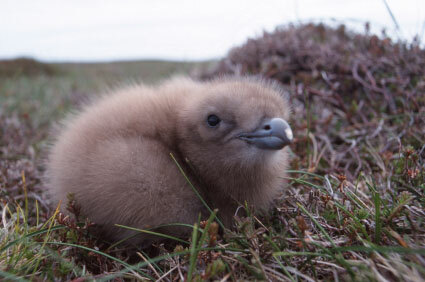 Skuas breed in the Summer in the Western Isles and Northern Isles of Northern Scotland. They come ashore to breed and this is usually the only time they come onshore, the remainder of the time they will spend at sea. 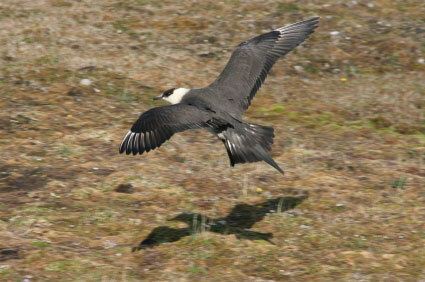 Skuas will defend their nest area aggressively, repelling other birds, mammals, and humans if necessary. Distribution is wide both in the Northern Hemisphere, including Scandinavia and North America and the Southern Hemisphere. The Great Skua is not found in the Southern Hemisphere, while the Chilean Skua, South Polar Skua and Brown Skua are native to the South. In North America, the smaller breeds of Skua are known as the Jaeger, from the German word for hunter. Skuas are related to Waders, Auks, Skimmers and Gulls. The Sea Skua is a British short range air to surface radar guided missile, scheduled to be withdrawn from service around 2012 to 2014. They are carried by Royal Navy Super Lynx helicopters, which can be deployed quickly from naval vessels. Inevitably, the Skua had to have an aggressive war plane named after it, and it did, in the form of the Blackburn Skua. The Skua entered service with the Fleet Air Arm in 1938, their first mono-plane. It was aircraft-carrier based, and was used both as a fighter and as a bomber.